This is a multi-faceted question which thankfully begins with a simple answer. The best thing to think about while you’re playing is…nothing. While it’s often helpful to make some strategic decisions ahead of time it’s typically best to have a quiet mind. As Phil Jackson once said, “The secret is not thinking. That doesn’t mean being stupid; it means quieting the endless jabbering thoughts so that your body can do instinctively what it’s been trained to do without the mind getting in the way.” Having a quiet mind is a grand but elusive quest. No thought or concern about outcome (i.e., winning or losing) – only process (i.e., being in the moment). There are at least two reasons why ‘mindless’ play produces better results than ‘deliberate’ play, and both have to do with the limitations of our motor system. First, motor function is negatively impacted by conscious thought. When we get deliberate, we lose fluidity, accuracy and speed. resulting in clumsiness. For practiced physical skills, it’s when we relax and “let it happen” that we get better results. Second, decision-making parts of the brain process too slowly for a complex game like handball. On novel tasks it takes about 1/3rd of a second to decide between two simple choices, and the delay grows exponentially with each additional option. By practicing, athletes see patterns of events in space and time and can learn to instinctively react with pre-programmed behaviors. These behaviors are motor sequences, a complex series of movements that, once started, tend to run without pause – as if on automatic control. If you’ve ever tried to stop a handball swing mid-motion you know how resistant to alteration these sequences can become! These behavior programs happen outside of conscious thought and are, therefore, an order of magnitude faster than deliberate actions. Since your first time behind the wheel of a car, think about how much better you’ve become at driving and how smoothly it goes when you just let your body and mind “do it.” Behavior programs are remarkably efficient and effective – and difficult to change. Ever tried to alter a fundamental aspect of your game? Athletes often describe having to “undo” old habits before forming new ones. It’s not easy to “just relax and play.” Failure to execute in performance situations at the same level as observed in practice is one of my most common referral problems. When the stakes go up, can an athlete play freely and keep their mind quiet? It’s understandably difficult for athletes facing the greatest test of mental fortitude in sport – the Olympics. Here, tens of thousands of hours and dollars can come down to a single moment. Yet, I see it at all levels of play, from novice to elite and youth rec league to the pros, for one simple reason: people want to win (or are afraid to lose) and they struggle to find that quiet, relaxed mindset – the one that seems to come much easier when the stakes are low. The Zone. It would be great to say, “just do these things and then you’ll be in the zone every time you play,” but sadly it just doesn’t work that way. There are no easy soundbites guaranteeing the ability to purposefully enter these zone states; however, a range of behaviors can markedly increase the likelihood. The most important elements can be divided into three components: physical readiness, mental readiness, and other factors. Physical readiness includes 1) adequate strength and conditioning; 2) skills training and practice; and 3) proper health behavior leading up to play (e.g., adequate sleep, hydration, and nutrition). Mental readiness includes having the right mindset 1) about competition as a whole (e.g., process versus outcome orientation); and 2) during competition (e.g., a quiet, present focused mind). Mental readiness also includes the regular use of mental skills such as managing focus, arousal, anxiety and expectations. Other factors effecting the frequency of zone states include 1) confidence; 2) recovery and letting go of mistakes; 3) daydreaming or time spent thinking about sport; 4) motivation and joy. On game-day, we need to do what we can to keep the right mindset. That means being mentally quiet and locked into the present moment with an intensity level on-par with the task at hand. Mindfulness has emerged as an exciting “new” technique regarding mindset. Generally speaking, Mindfulness is a state-of-mind that involves acceptance, awareness, and non-judgment of the current moment. It’s important to recognize that Mindfulness is not the same as meditation; meditation is an activity, where mindfulness is mindset. Mindfulness is present-focused, conscious, and active engagement in the moment as it is. The athlete is aware of what is happening internally and externally, but rather than trying to judge, react, evaluate, label or deliberately change what is happening, the mindful athlete is open, curious, and compassionate. For example, the thought “I’m going to lose this match” becomes, “right now, I’m having the thought that I might lose the match.” Rather than seeing this as a fact or objective truth, the mindful athlete sees it as a thought – one of many that may or may not have relevance. Heightening sensitivity to the moment and context, the mindful athlete is tolerant of their state of mind and body, radically accepting of what it is happening, and in so doing can let go of the need for control. Studies have shown that Mindfulness improves emotional regulation and attention regulation, which in turn helps athletic performance. Mindfulness training programs are designed to help athletes focus on the task at hand as it is occurring in real time and to let go of control. It might seem counter-intuitive, but letting go of the need to control our attention and thinking results in improvements in attention and thinking. The result is prolonged ‘effortless concentration’, which is a central component to zone states. Emotional control means maintaining composure and calm, particularly under adverse conditions such as making mistakes/errors, getting a bad break, a ‘lucky shot’ by an opponent, or controversy with the referee. Here too we see evidence that Mindfulness practices are associated with improvements in emotional regulation, also known as resilience, including fMRI studies indicating changes in neural activity to stress-response centers of the brain. Developing Mindfulness. As with other sport skills, you can’t expect Mindfulness to work without practice. I suggest a two-pronged approach. First, incorporate mindful thinking into practice sessions by intentionally creating scenarios that require patience and tolerance to adversity. One technique I’ve used is handicapping myself in a way that insures a very tough, and likely losable, match. For example, I’ll purposely weaken the effectiveness of my play by hitting a serve I’m trying to develop, play to an opponent’s strength or only hit kill shots off-handed. Under these conditions, which in itself is fabulous training, I’ll work on my state of mind. I’ll try to stay in the moment, aware of what happens to me physically and mentally throughout the match without judgment, and accept the outcome of each shot, point and game. The goal of this exercise is to create a competitive scenario where I can practice and experience a state of Mindfulness. Second, find moments off-court to practice Mindfulness skills. There are several ways to do this, and I’ll share some of my favorites. A quiet meditation is the most common technique, where you set a timer for 3 to 30 minutes and allow your mind to drift without focus or intention. When your mind tries to settle into a thought pattern – like planning dinner or scheduling your day – deliberately work to drift back to your present by focusing on your breath and allowing the thoughts to float away. There are many podcasts and YouTube links devoted to meditation if you’re looking for guides, such as Headspace. While meditation is convenient and simple, I prefer two more dynamic exercises: The Slow-Walk and Savoring. As the name suggests, A Slow Walk is an exceptionally slow walk where you focus all of your senses on self and surroundings. I’ve taken 30-minutes to walk 30-feet, absorbing the feel of the wind and sun, the sights of nature and shifting light through trees, the scent of the earth, and the swirling of my internal world and body as I balance into micro-movements. I was first exposed to the slow-walk during a Mindfulness workshop several years ago, and it’s become a personal favorite. Savoring is an exercise I often use when exploring Mindfulness with athletes. It’s easy, quick, and involves candy. Get an M&M and take your time exploring it with touch and sight. Place it in your mouth and, deliberately focusing on savoring the experience, use your full senses to explore and fully engage in eating the M&M. Notice how it feels, and the changes it undergoes throughout the process. Pay attention to the sounds, sensations, textures, and taste on a moment-by-moment basis. Once it’s finished, be quiet with yourself and contemplate the experience. Savoring can be done with anything – a sunset, the atmosphere in a crowded room, or while drinking your first cup of morning coffee. The goal of these exercises is becoming familiar and comfortable with a deeper state of mindfulness off the court. Yet being able to play with a quiet mind, particularly during tournament play, has broader implications to managing stress and coping with adverse events. Mindfulness has shown excellent efficacy towards reducing symptoms of various mental health concerns such as anxiety, PTSD, anger management, depression and ADHD. This issue of Wrap has been about getting in the zone, and specifically using Mindfulness to learning how to quiet your mind. Our question also asked about intensity levels, but I’m going to hold off on that one for another issue of Wrap. Interesting question. I draw an analogy to cooking. Depending on your opponent, the score, the environment (tournament match, money) and the opponent (most importantly their capabilities, which may vary during pressure situations) you have to know how much “flame” is appropriate. The important things are to be aware and to make intentionally well-informed decisions. When I’m in the zone, I have nearly no recollection of it. Why? Probably because I wasn’t doing any conscious thinking. Conversely, if I’m playing like my normal lazy self, I could probably give you a detailed account of every point. So how does one get in the zone? Let me know when you find out. Certainly having some proficiency and confidence is a good start. Beyond that, I don’t know. The secret is probably related to being completely in the moment. Being present is always the goal in life, but one of the harder things to achieve. Maybe it starts with the breath? I know Dave Chapman was a big proponent of proper breathing whilst playing…I’d take his advice. This is an interesting question because the truth is that it depends on who you are, how you’ve trained and what is going on at that moment. There are an infinite amount factors that can influence an outcome and cause a person to make bad decisions at the end of a game. All we can do is prepare ourselves as best as we can in an effort to increase our chances of success in those moments and avoid making horrible decisions. I’d break it down to three equally important parts/factors. The physical, the mental, and the spiritual/inner self. If these 3 things are working together towards the same goal than you can eliminate any hesitation or doubt that can cause you to make horrible decisions in the clutch. I’ve had plenty of experience taking chances in big moments along with moments that I’m sure left people scratching their heads wondering “what was he thinking?” For me it has always come down to how well I trained. If I was physically fit but not sharp then that would lead to some miscues and desperate scrambling moments where my opponent ran me around and I’d end up working too hard for each point. This led me to attempt shots that were out of my “range” or not in my skill set in an attempt to end the volley. Taking high risk shots instead playing the percentages would only pay off a small percentage of the time (naturally). Another path to bad decision making has been when I practiced but did not really train off the court. I’d be sharp but out of shape. In that case I’d start strong then eventually fade out to the point where I was spent and the shots that were going in when I was fresh, I would miss when I became tired. Both scenarios have led me to some tough memories. The off-court training gave me the physical ability to perform while the practicing would sharpen my physical tools as well as sync them. Both the exercises and practice sessions worked hand in hand. Once this part of the training was in place it helped me feel ready mentally because I knew I put the work in. Confidence allows you to not only open the doors of success but to walk through them. Preparing mentally may actually be the most important part. I would do a lot of little things in order to prepare mentally for an event that I was really driven to win. I watched tape of my opponents and of myself to learn everyone’s strengths, weaknesses and habits. I looked at patterns that worked for the champions of years past. Prior to winning the singles nationals in 2008 I knew I had to change something about my game in order to beat Satish, because he edged me out 2 years in a row at that point. I asked around and heard about Steve Sandler’s serve that helped him in his later years of play and how it helped him win his last title. It reminded me of a very familiar serve that I witnessed Eddie Maisonet use and win with. I practiced serving from left to right against what most players were doing and it worked wonders for me. This idea and information gave me what I needed for my practice sessions. I’d look for players with different styles so that nothing would be new to me when I saw it. Over time I would play and implement effective strategies without really doing much thinking on the court because I was used to adapting to all styles of play. Studying my craft as well as other styles really helped me succeed, especially when the pressure was on. I wanted to be as prepared as possible to lessen the pressure and to rid myself of all hesitation. When the pressure is on you go back to your habits and your instincts. And if your instincts are that of another game, then it usually hurts you in the end. Playing out of your element can lead to bad decisions. Examples of that are on display whenever you see players crossing over into other versions of the game. One-wall players typically play close to the front wall, shooting in front of themselves and creating wide angles left to right. Three-wall players play more front and back court with deep court drives. Four-wall players have shorter passing shots that don’t make it to the back wall and they use a more controlled ceiling game than the driving ceiling game of 3 wall. Bad decisions at critical moments happen to crossover players because they’re breaking their routines, which are important to athletes. Our routines play an enormous part in our play especially at the end – when the pressure is on. For me, as a crossover player, I felt the most important part was what was going on with me internally. When I had my inner peace, I would be able to perform at the highest level. I remember feeling as if I was almost levitating while moving around the court. Nothing mattered other than myself, the ball, and the wall. I didn’t have to think about much of anything. I just played and knew that I was prepared to perform my best. Prayer and meditation have also helped me through some difficult times. Any form of mediation can be helpful in keeping things in perspective and finding peace. When the pressure is on, being centered is the key to making the right decisions. When you are centered, there is nothing that can waver your will. Whenever I feel like I’m losing my way or I feel fatigued, I focus on my breathing to return to my center. Most of the timeouts I’ve used through the years have been for that reason. I refocus on the fire within to channel it in the most productive possible way. If you’re asking me if you should you get fired up or relax when the pressure is on then I’d have to say…both! Relax to focus in on your target, then release that fire onto them. If you can get to that place of focus and intensity then nothing else will matter and you won’t have to worry about horrible decisions. This is an interesting question and I’m sure has been asked by many. In regard to which is better – “Just relax” or “Get fired up” – I think it depends on how I am playing. Am I already too relaxed and not playing aggressively? If so, that might be the time that I tell myself to move my feet, stay on my toes, and get fired up because I am under-aroused. However, if I am playing nervously, forcing shots, and feeling tight, I need to tell myself to breathe, focus on the ball, and do what I know how to do because I am over-aroused. Thus, what I tell myself in a match is dependent on sensing my own level of arousal and adjusting to it. Having said that, I generally focus on self-talk prior to the match. I think positively and visualize the shots I need to hit. I try to go in with confidence so that there is not much adjustment to make while I am playing. But, as well all know, the pre-game routine may not remain effective during the course of the match. One of handball’s greatest players and my personal hero, Naty Alvarado, Sr., gave me some great advice when I was playing in a tournament in Denver. I was exhausted and not playing well so I called a time out. Naty Sr. saw me in the hallway and asked what I was thinking about. I said, “About how tired I am and how crappy I’m playing!” He said something like, “No. Don’t think about that. Think about the shots you need to hit. Think about what you need to do – not what you are not doing right.” No doubt he won’t recall that episode, but I carried that with me throughout my playing years. I always came back to that. If I was playing in a panic, I would tell myself to relax and think about what I needed to do. If I was playing lazy and too relaxed, I would tell myself to push and think about what I needed to do. Of course, there are specific matches and times when other things might work for me. I do recall playing in some critical matches where I was serving and telling myself strategic things like “keep it low” or “keep it off the sidewall.” I recall one specific match where I had come from behind and my opponent called a time out in frustration. I just told myself how fun it would be to win the match after coming back from so far, and that motivated me to play harder. I was also incredibly fortunate to play with partners who would tell me what to do! So, all I had to do was execute (thanks, Allison and Anna!). Pete Tyson also provided great advice when he told me, “Have a plan for every shot.” I only wish I could have done that more, or that I could have had a more specific plan other than “get it back.” Regardless, it still boils down to thinking about what I need to do and thinking positively. A close friend and sport psychologist, Dr. Ralph Vernacchia, explained it in very simple terms. When you are on your way to the store, you’re thinking about what you need to purchase, the specific store you will visit, and perhaps the most efficient way to get in and out of the store with what you need. You don’t have thoughts like “I’m not going to work” or “I’m not headed out of town.” In other words, you are thinking about what you need to do and accomplish – not what you don’t want to do. Why not apply this basic principle in sports competition? Overall, it’s a tough question to answer and it is so dependent on the situation. It does take tremendous self-discipline and composure to manage one’s mind in the court. My best advice is to work to become more self-aware to know what is needed and what works best for you. Be able to assess how you are playing and feeling, and then focus on the positive. The moment [beginning or end of a match] and your opponent’s ability should influence what action to take. For instance: my opponent is having trouble returning a hard, low serve. This should dictate an approach of being “fired up” and continue with velocity on the ball and most likely, an “aggressive” approach on the serve and possibly continue into the rally with fly shots. Conversely, an opponent may be reacting successfully to my aggressiveness on the serve OR my attempt to end the rally with my ill-timed kill shots. Hence, a more “relaxed” and conservative approach [lob serve] would potentially frustrate my opponent and make my volley shots more effective. Take what the moment offers and execute until your opponent makes a strategy change. I get equal satisfaction from a well-placed killshot or a volley ending v-pass. Is one not considered an “aggressive” shot and the other a “conservative” shot, yet both deliver the same result? All too often we tend to label velocity and fly-shots as being an aggressive approach; true, to an extent. However, “conservative” kill shots [not going for the bottom board] and simply taking the ball out of the air reduce the amount of running I have to do and should increase the amount of running my opponent has to do. Hopefully, he or she will tire before I do. So, I’ll take on both. 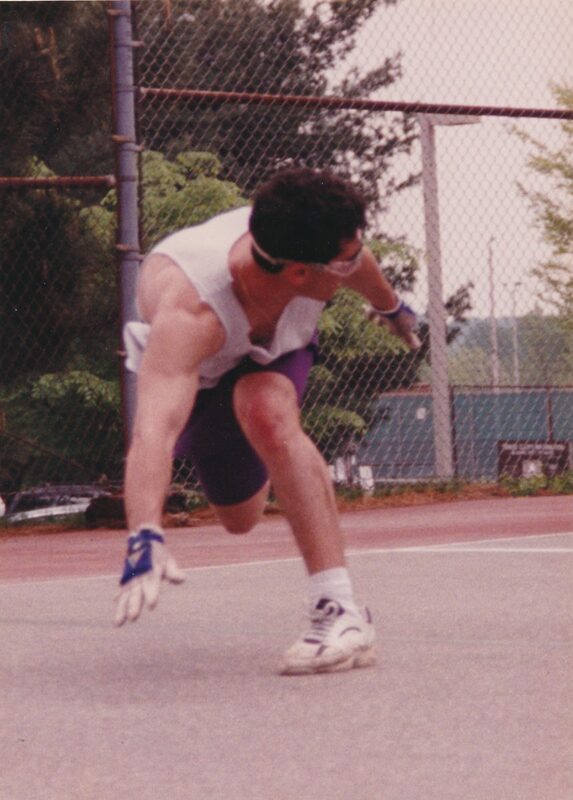 1) I’ve been there on the what were you thinking subject and as conservative as I was during a match on the handball court, I often told myself to “go for the shot.” Otherwise, after the match, you’d wonder “what if I had taken the shot?” Would that have won me the point or the match. That’s a terrible thought, so like in life, the shot you’ll never make is the one you don’t take. 2) If you don’t get a little fired up for a tournament match, you won’t be playing your best ball. That’s why we test ourselves in tournaments. On the other hand, too fired up and you waste energy while you’re making errors on the court. During my career, I found I’d get closer to the “happy medium” of being fired up vs. relaxed as the season wore on and there were more tournaments under my belt. So, the best way to find the right amount of adrenalin for tournament play is to play a lot of tournaments. Dialing the energy level in is very important for playing your best when you need to – in a tournament. To play your best you need to know your and your opponent’s strengths and weaknesses. Pregame visualization of what you will do in various situations, expected opponent reactions and your various counter reactions should prepare you for the match. Then stay focused on the match and what is working best for you. Stay alert and confident at all times during the match. Indecision and questioning your judgement during the match does not instill confidence in yourself and probably will lower your performance level. An opponent can sense a lack of confidence and that can raise his level of play and work to your determent.